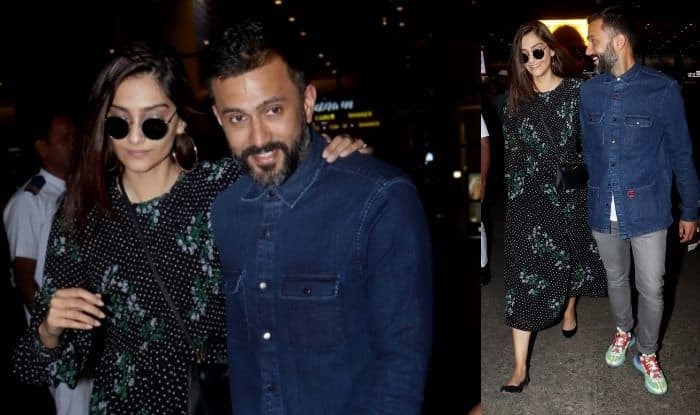 Sonam Kapoor has finally returned to Mumbai after spending New Year with her husband Anand Ahuja and friends in Bali, Indonesia. The fashionista of Bollywood who never fails to impress the fashion police was spotted at the airport in a floral print midi dress by Ganni. Walking hand-in-hand with Anand, Sonam nailed her look as always. Sonam is always seen at her best whenever and wherever spotted. Earlier today, the Neerja actor owned the airport floor by walking in a black floral print midi dress by Ganni. Sonam has managed to look stunning in any outfit she dons. From rocking in a basic t-shirt and denims to dazzling in embellished designer outfit, Sonam has nailed every look of hers. Today, Sonam kept it simple yet stylish. She accessorised her dress with a sling bag and round vintage shades. With open hair and no make-up, Sonam gracefully carried her floral dress.